(CNS): The talks between the PPM administration and Dart Realty have made no progress, the premier has confirmed. After months of silence on the subject, Alden McLaughlin stated Wednesday morning that the talks between his government, which began shortly after the election last year, are ongoing but they were not making any progress, which was why ministers had remained silent. The talks are focused on efforts by the CIG to renegotiate the deal between it, the NRA and Dart signed by then premier McKeeva Bush in December 2011. The PPM government is on record as describing some elements of the deal as unacceptable and wide concerns remain that it is heavily in Dart’s favour and does not represent value for money for the public purse. The discussions are understood to include talks about the remaining stretch of the West Bay Road as well as the issue of the hotel accommodation tax rebate, which appears to be one of the major stumbling blocks in the talks. The PPM did state on the campaign trail that it would be seeking to renegotiatewhat is now commonly known as the NRA deal. It was hoping to have some form of through access in the area of the West Bay Road, which is now completely blocked since the previous interim administration and former UDP members gazetted the closure. However, the Progressive administration admitted shortly after being elected that the closure appeared to be irreversible. While the remaining stretch is still in its hands, no one from government has said whether or not that remaining strip of road can be saved because, despite the existing deal, the government will still need to gazette any closure and so retains a strong negotiating tool. At a PPM public meeting shortly after the election, Works Minister Kurt Tibbetts, who now has responsibility for the NRA, made it clear that the 50% accommodation tax concession given to the developer in the deal, which spans a thirty year period on any hotel or tourist accommodation Dart buys, builds or otherwise acquires was not acceptable. The concession will see Dart keeping half of the taxes charged on all accommodation for ten years after the opening date, not just on the proposed $200 million hotel and condo resort on the West Bay Road but any other tourist accommodation it owns in the future, which could have a serious impact on the public purse if the developer was to acquire any existing accommodation. It also undermines potential earnings for government in future, given the potential buying power of Dart as the island’s largest land owner and investor. Tibbetts has also previously stated that such a generous concession was presenting problems to government as it entered into talks with other developers, who all now ask for the same concession before discussing any potential tourism investments. It is not clear if the lack of progress in the talks will have an impact on Dart’s plans for the proposed hotel on the site of the former Courtyard Marriott, which the developer says is due to open as a Kimpton Hotel in 2016. As the talks stall, four ladies from West Bay are also still waiting on a Grand Court decision from Justice Alex Henderson regarding the legal action they took against the government over the way that the West Bay Road was disposed of under the NRA agreement. A judicial review application regarding the same issue was denied last year as a result of timeline technicalities before the substantive argument over the legality or otherwise of the roads closure was ever considered. Alice Mae Coe, Betty Ebanks Annie Multon and Ezmie Smith managed to take the issue further and although both government and Dart’s lawyers had argued that the law suit was the wrong way to deal with the complaint, they were able to present their full case before the judge at the end of last year. The hearing took place between 9 and 13 December but no date for the ruling has yet been confirmed. What a great idea, if only there's was money to do it.. The moaners can stay away from Camana Bay then. Would make it better for the rest of us. Ever heard the caution "beware of Greeks bearing gifts"? So a developer throws some chump change (for him) at the country and initially creates a park or two. That's great. Very generous. And such marvelous quality, for sure.Then the investments gather pace and suddenly, for some naive souls, his organisation is the greatest thing to ever happen to Cayman. Can't anybody see what's coming, I mean when this developer owns so much of the country and employs so many of its people that it effectively controls the vote and the legislative process? What a path of calamity has been embarked upon by our short-sighted political Simple Simons. God help us if we don't put the necessary controls in place to control and properly regulate our developers. Very well said. The problem is too many of our people have drank the cool aid and believe that this developer is in fact God. So when you say "God Help us" They agree with you. It has to be stopped!! So many of it's voters?! I think if you had any facts to backup your claim I would be inclined to believe you, but I am fairly certain youroutragous claim is unfounded. In fact, if you compare the amount of voters on island to the amount of voters actualy employed by Dart you will understand you are not really being accurate. Thank you for your response. Actually i did not intend to make any claim, "outragous" (sic) or otherwise, but merely to suggest a likely consequence of what could occur if a large enough number of voters (including non-developer employees, obviously) are beholden to one employer for their livelihoods in any small community. Most countries have legislation in place to preclude this happening. Whether you consider this to be prompted by "unfounded hate" (whatever that actually means) is a matter of opinion, but I would urge you to think a little deeper on the issue, and certainly beyond the present number of employees of the developer you mentioned. I believe you are confusing those who vote for legislators with how legislators vote after being elected. It's like the difference between giving birth to someone and raising and nurturing someone. For example, West Bay voters elected McKeeva, but his infant political nurture came from elsewhere. Beware of two faced bigotted individuals! Ask why our own Government or indeed our own multi-millionaire Caymanian Families hadn't created family parks for the enjoyment of all peoples in Cayman – why did it take a foreigner to make these civic minded projects? In fact, ask why many Caymanian owned business don't employ Caymanian in preference to Filipino workers? Ask why has this country become a blaming game amongst our governing members for the dire state we are in. This is truly a NIMBY situation! We have a beautiful safe new dual lane road to West Bay – our Government would never have done this – we would still be fighting the traffic along Willlie Farrington. Just as they promised and failed to deliver on the airport and the cruise ship landing and to that matter the financial mess of building the Clifton Hunter School – this would have been better used for ICCI. The ironic point of your statement is that CIG does in fact employ more people than anyone else and that virtually guarantees the status quo and continued cycle of "it wasn't me – it was them before" and the petty politics of looking after one's self. We need MORE DART's = more competition = higher standards = lower prices!!! That's the model of a free economy. Take a look around you and you will soon see that Cayman can and will fall by the wayside – if it doesn't do something to improve its foriegn investment relations. One thing I firmly agree with you on is that necessary controls should be placed on bigotted individuals that cannot see the bigger picture, due to their own lack of understanding and worldiness. 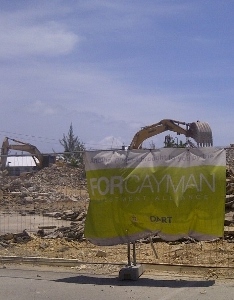 I agree, Dart has shown more concern for Cayman then our own leaders or any of the so called Rich Caymanian families who are only interested in hiring expats and filling thier own pockets. Na mon, he took the Greeks for a few hundred million too. All things considered the road is built and being used. It appreciated by all. But the fact is Dart can pay more…and should pay more. All in favour of Dart paying more say.." Aye "
Are you willing to pay more to help those who have less than you ? And for you information Dart is and has been paying more than everyone else all along. The problem with people like you that always have their hand out, is that you will only be happy if the next man is paying for everything so you don’t have to pay for anything. Straight up, that's why we have 9000 Caymanians on the dole. Of course not a contract signed with CIG means nothing after the next election. Investor need to keep that in mind prior to signing any deals with the CIG. Hide and watch. When all is said and done there will nott even be the "bike and walking trail promised on the beach. There will…..if the government moves on from wanting to renogiated a signed deal, that was signed with a duly elected government. 10:28, how thick are you? If a contract is broken (by Government), then DART does not owe us anything, nor does DART have to carry out anyhing promised, but guess what? We will all have to pay the piper. That deal was highway robbery by the developer and sheer stupidity by the UDP. Hopefully the Progressives will remember this and not defend Julianna O'Connor-Connolly who played an integral role in this mess. Disgraceful that they would allow her in the party and reward with Speaker's position. I don't see anyone else stumping up the cash to build it. This is a deal that was brokered between two professional entities. If CIG did a bad job of negotiating then it's their fault not Darts. These infrastructure project pump millions into the ecomony and help keep Cayman working and afloat. CIG had to make tough decisions… make concessions and get millions in import duty and employment for many local firms or hold out in the worst financial crisis since the 1920's for a better deal. You know what they say. "A bird in the hand is worth two in the bush"
Why is there no mention of that fact that there is a CAP on how much of this concession Dart can collect, or the fact that this is the way they are to recover the money they spent on building a new 4 lane highway for the CIG, new expanded public beach facilities or the 5 Million Dollars they gave in upfront money for the CIG to establish a Mortgage bailout program for people about to lose their homes. People make it seem like Dart just got these concessions for free it will take them decades to recover all the money the put out if they ever do. Any other developer that asks for these type of concessions should be asked what will they do for Cayman in return. Concessions like this don’t come for free. How many other developers build highways and parks and turn them over to the CIG. EXACTLY! Or that this will generate economic activty and eventually provide a venue that will attract further high-end tourists, conferences and conventions. Or would we all prefer to still have Stan Thomas' gutted Marriott Courtyard that was closed in 2008 to stare at (to go along with the soon to be 10th anniversary of the derilct fromer Hyatt Regency)? Lets get this moving. Dart could have the beach park, the walking/bike trails done in a few months if we can get over this government nonsense. Well spoken anonymous-09:36. There is no "free lunch." That applies to everything in life. Dart or no one else does anything for free!!! He got a new road which is most beneficial to him for his development. West Bayers already had a road and we West Bayers want our whole road back!!! He got millions of dollars of valuable prime land because our Caymanian politicians were so stupid and greedy that he took advantage of the situation. From the time I heard that he was building parks in Cayman I knew there was more to it than that. He truly bought our government out!! When one truly wants to give something from the heart they don't put out press releases. I hope our people wake up and realise what they're doing to themselves and the next generation. All he got was part of an old two lane road he already owned all the property on both sides., while we got a 4 lane highway that everyone including West Bayers enjoy and yes it did benefit him to be able to combine his land but as you said nothing is free nor should it be..
You're not getting it back and it wasn't your's in the first place, it was crown land not your land. If you feel that strongly about your land, then stop driving over Darts highway every day nah, take boat and come George Town. Ya can't have ya cake and eat it too. Ahem…….. Every developer in the Cayman Islands, even the smallest subdevision, has to construct roads in order to obtain planning permission to sell their land. This is exactly what Dart has done, he developed the necessary roads in order to develop his land further. No more no less. He should get NO concession for building his road any more than any other developer. You're taking about roads not highways, to develop his land he didn’t have to build a highway..
"wide concerns remain that it is heavily in Dart’s favour and does not represent value for money for the public purse" from the ignorant and prejudiced maybe. Anyone who has read the reports knows it is a great deal for the Cayman economy and the government. There is nothing to renegotiate. Move on and use the time to address OMOV.